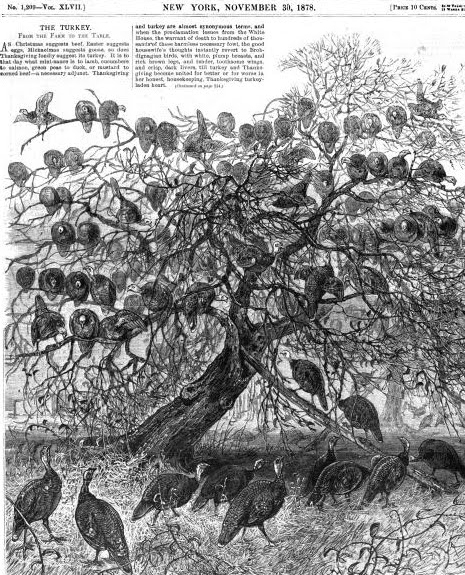 "The New York market draws its turkeys from north, south, east and west, the largest farms being in Connecticut and New York State, three farms in the former raising 10,000 birds for every Thanksgiving Day. Washington Hollow, a picturesque valley lying twelve miles east of Ponghkeepsle, contributes its quota to the general “gobble,” and hither the special artist, with the writer, proceeded last week, in order to behold the turkey in the wild wantonness of the stubble, in the precarious tenure of the roost, in the clutches of its slayer, and finally undergoing the grim preparation that was to render it a thing of beauty to the enterprising frequenters of the Washington or the Fulton Markets. The last glories of red and russet and gold were upon the trees as we turned into the farm of Mr. James Briggs, situated in the very heart of Dutchess County. The pre-Revolution farmhouse of red brick gave us welcome, while its proprietor forthwith proceeded to unravel the mysteries of turkey-raising. Domesticated turkeys thrive best on high, dry, and sandy soil, and when grasshoppers are plentiful can pick up their own living. In temperate climates they generally lay twice a year, fifteen eggs or less, white, with small spots of reddish yellow. The female is prolific for five years, though those of two or three years are the best hatchers. Incubation lasts twenty-seven or twenty-eight days, and they are such close sitters that food must be placed within their reach. The males utter singular notes resembling the word “gobble” several times repeated- hence, in the language of the farmyard, the male is spoken of as the gobbler. Turkeys are hatched in May, the young birds being kept in coops, on the ground, till they are able to care for themselves. The coops always placed in a dry lace, are open, with slats in front, so as to afford light and air. The slats enable the pouts to run in and out of the coop, the mother remaining in durance vile. If the weather is damp the slats are shut down. The newly hatched are fed on curds till they are six weeks old; then with meal, mixed with curds. After this cracked corn, and with the cracked corn - freedom, as they are now permitted to roam at their sweet wild will during daylight, sunset seeing them cooped. In October they are fed on buckwheat and hulled corn as a preparation for Thanksgiving, and later on with meal in water. One hundred turkeys will eat a bushel and a half of corn. As we stood on a road attached to the farm, we heard a "chip! chip! chip!" uttered by one of the hands from behind a distant barn, and in an instant the whole flock of turkeys numbering several hundred were enroute to supper, wobbling along with that ungainly motion, half-running, half-falling, their necks craned out, their heads seemingly too heavy for their necks. Following them up, we struck upon s picturesque sight. At the entrance to the barn, which had a background of golden-tinted trees on which the setting sun was casting is peachen bloom, stood two patient and meek-eyed oxen, the wagon to which they were attached being unloaded of its burden of saffron-hued corn. Standing in the middle of a flock of five hundred turkeys. a stalwart youth was engaged in flinging the golden grain in a vast semi-circle till it rained and hailed upon the backs of the eager and earnest birds. Not a head, not a tail, was to be seen, save on the outer edge of the flock, and the rush to secure a good place was- to say the least of it- very human. The gobble was of short duration, the turkeys very sensibly, the instant the last grain of corn and disappeared, moving slowly in the direction of the orchard - and forty winks. Hither we followed them in order to witness their scramble for an eligible bough- one that was neither too thick or too thin, too high or too low, too firm or too willowy. 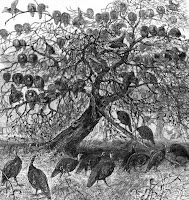 Two gobblers fought “a long hour by Shrewsbury clock” for possession of the extreme left bough of the apple-tree in our illustration- now on the bough itself, now higher up, now lower down, their struggles bring in many a bird which had tucked itself in for the night to untimely grief. The smaller gobbler triumphed, causing his more portly rival to seek a roost upon some other tree. Wild turkeys mix well with tame ones. The experiment of bringing the wild ones from the West has proved highly satisfactory. “If poultry is well cared it pays," said Mr. Briggs; “if it is not, it don’t. High ground is what turkeys require, wet kills them. A wet season drenches them to death. I have great trouble when the young turkeys get the ‘gapes’ a sort of worm in the throat. When they get it, they open their months and begin to snort. I can take the 'gapes' out with a hair looped, or a feather. The pouts are very subject to lice; when find them this way l give them sulfur with their food. Ah,” he added, with a sigh that carried conviction with it, “turkeys are very delicate birds to raise." It requires considerable technical skill and dexterity to kill a turkey marketably, as the struggles of the doomed one for dear life are simply frantic. The knife, double-bladed, ls thrust into the throat, a cut is made on both sides of the neck, and the blood runs out, the head of the bird being held downwards. The turkey is then dipped or "scalded" three times in boiling water, when it is ready for picking, an operation that lasts about ten minutes. When picked, the bird is plumped. This operation, which serves to tighten the skin, is performed through the medium of alternate hot and cold water-baths. After plumping, which is usually done at night, the birds next morning are packed in boxes in straw and forwarded to market. 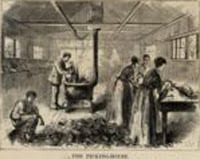 It is an animated scene, as represented in our illustration, the killing, picking and plumping, out in the Indian Summer under the leafless trees. The turkey farmer usually treats with an agent, who comes round late in the Fall to examine the condition of the birds. 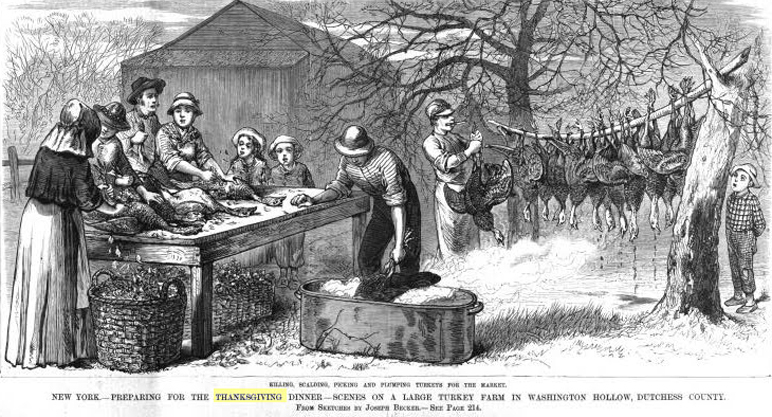 On account of the dearth of grasshoppers during the Summer, turkeys will be somewhat later, and possibly dearer, than last year. From nine to ten pounds is considered a good hen-turkey, while an eighteen-pound gobbler is reckoned a very fine table bird. Briggs has raised them to forty pounds, but they don't pay at that weight, as the hens, if too large, inadvertently break their eggs in hatching. If a hen lays less than fifteen eggs it is called a “short litter." The eggs are then broken up, and in nine days she will lay again. The heaviest turkey ever sold in Fulton Market weighed forty-three pounds. Some idea of the demand for turkeys at Thanksgiving may be formed, when one firm in the market disposes of 25,000. This firm sends out a hundred tons of poultry during Thanksgiving week. 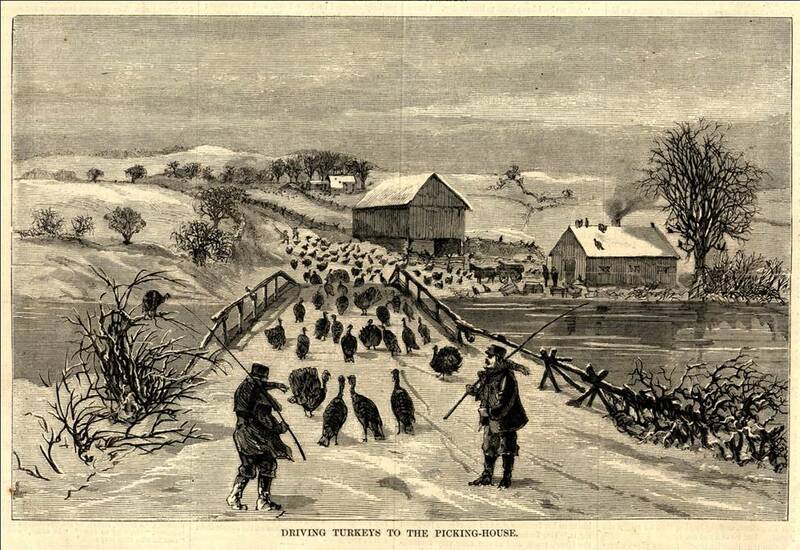 The average price of turkey is from fifteen to twenty cents per pound, but as high as thirty-five cents have been paid when the birds were scarce. One of the sights of New York is Fulton or Washington Market on Thanksgiving eve. Every alley is choke full, every body must have a turkey, and every poulterer declares at the top of his lungs that he can produce the largest, the cheapest and the best. Impromptu stalls are erected, and over them blazes the lurid light of lamp and torch, a fight that would send joy to [Petrus] Van Schendel’s [1806-1870] artistic cart. “My Lord of Norfolk” [a breed in UK] is a stately fowl weighing his fifty odd pounds, and fit to grace the baronial hall in Merrie England at Yuletide; but although his flesh is white, his flavor is but poor and insipid when compared with that of the" gobbler" which comes into the market all over the length and breadth of this fair land at the close of the month of November. The flavor of the American turkey is a delicious specialty. Although the turkey was exclusively an inhabitant of North America in its wild state, the earlier naturalists supposed it to be a native of Africa and the East Indies, while its common name is said to have arisen from the belief that it originated in Turkey. It was carried to England in the early part of the sixteenth century by William Strickland, lieutenant to Sebastian Cabot, and since that time it has been acollmated in most parts of the world. 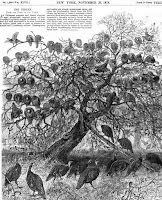 The progenitor of the present race of domesticated turkeys is not known with certainty; some naturalists incline to the belief that it is the Meleagris gallopavo while others consider it to be an allied species now extinct.